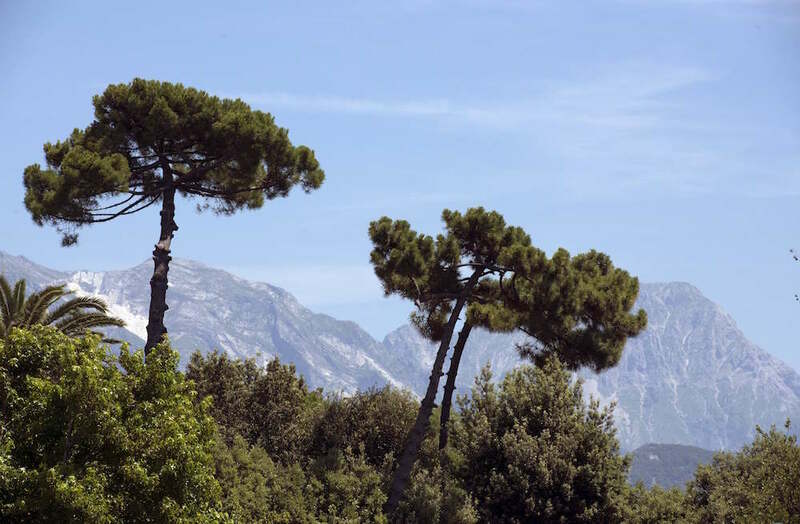 Tuscany is one of the most well-loved parts of Italy, but most international travelers overlook the region’s northernmost province, known as Massa Carrara. Wedged between Tuscany, Emilia-Romagna, and Liguria, Massa Carrara is one of the most underrated destinations in Italy, worth a detour for its beautiful beaches, its rich cultural heritage, and its most famous export: Carrara marble. From the green waters of the Ligurian Sea, the mountain range known as the Apuan Alps rises dramatically into a striking landscape of craggy peaks covered in scrub brush, twisted trees, and marble deposits so white they give the false impression that the mountains are covered in snow. The ancient Romans already appreciated the rich deposits of translucent, grey-streaked white marble of the Apuan Alps. Documents from the second century BCE record the quarrying of Carrara marble for the building of the Roman forum. In ancient times, stonemasons chopped fissures into the earth, then inserted wet wood that, when it expanded, caused the marble to break off in giant pieces. Their mode of getting hunks of marble down the mountain—a sled-like contraption on a wooden track—was used through the twentieth century. During the Renaissance, sculptors made the Apuan Alps famous. “The more the marble wastes, the more the statue grows,” wrote Michelangelo Buonarroti. The Renaissance master knew a thing or two about the marble quarries near Carrara, where he traveled to select raw materials for his famous Pietà and other sculptures. Every piece of Carrara marble was special and specific to each of Michelangelo’s projects. The block used for Michelangelo’s famous David had languished in the work yard of Florence cathedral for forty years before he tackled it; legend holds that the artist had in mind one of the hulking Carrara stonecutters as the physical model for Il Gigante. Michelangelo wrote that he dreamt of one day carving another colossus like the David—this time using an entire mountain of marble near Carrara, a kind of Renaissance Mount Rushmore—that would overlook the sea. 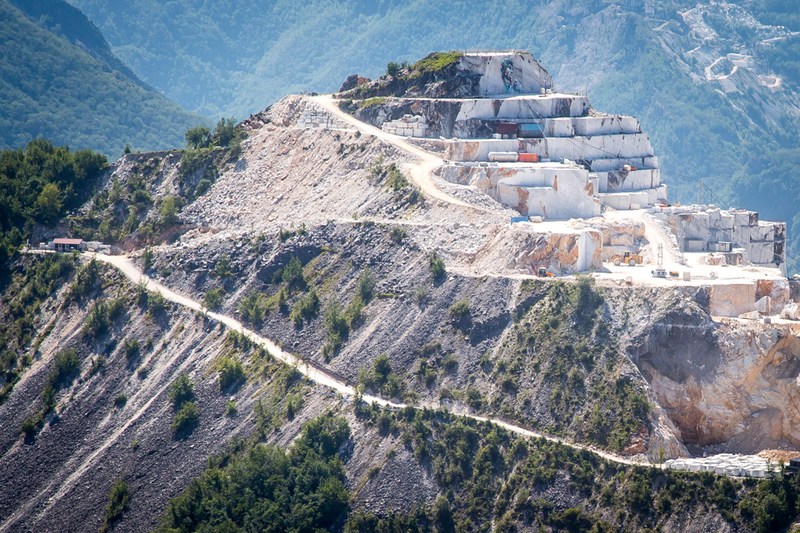 The main attraction in Carrara is a visit to one of the marble quarries. Even though the old systems of pulleys, ramps, and sleds have been replaced by modern mountain-moving, quarrying, and even robotic equipment, you can still appreciate the centuries-old tradition of removing white chunks of marble from the mountainsides. A small fleet of off-road vehicles awaits your arrival at this guided quarry experience. This tour is a good overall education about the techniques of marble quarrying, along with an exciting ride up the mountainside. Located just outside of Carrara in Fantiscritti, this guided tour takes you inside a marble cave. 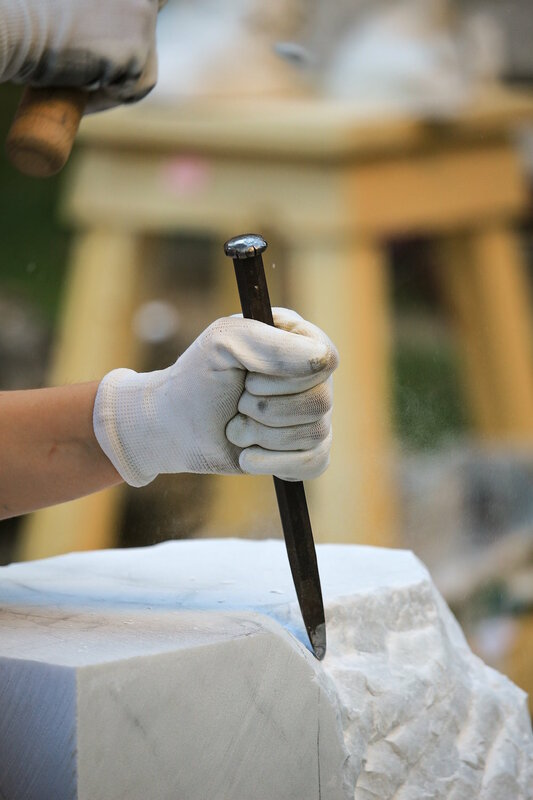 In addition, you can appreciate a curious and somewhat chaotically organized collection of tools, machinery, sculpture, and other artifacts related to the history of marble quarrying. 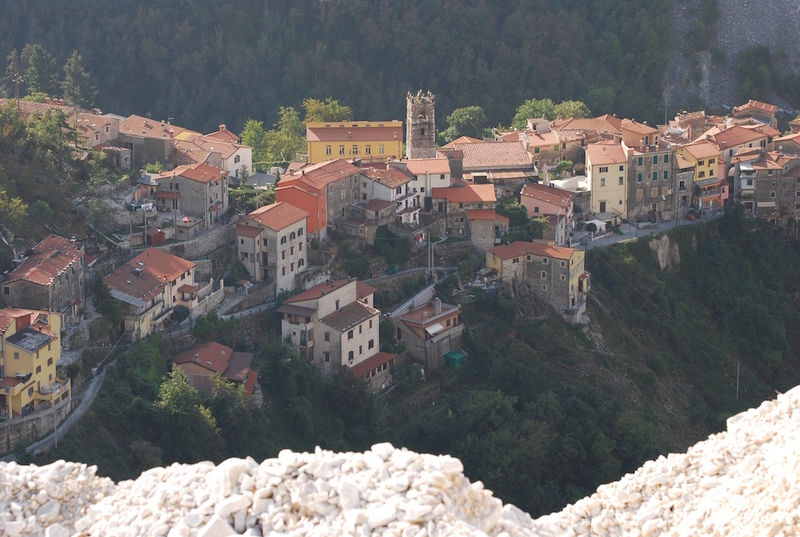 The museum provides an informative overview of the history of Carrara and its famous marble. The video is worthwhile, especially if you are not taking a separate tour of the quarries. You can also view several hundred works of marble sculpture from Carrara and around the world. If you want to leave with a clearer idea of what authentic Carrara marble looks like compared to other types of marble in the world, the museum is a great place to start. A detour to the nearby village of Colonnata makes for a white-knuckle driving experience, with narrow, windy paths up the mountainsides. While the driver needs to keep their eyes on the road, passengers can enjoy unparalleled views of the marble quarries along the way. 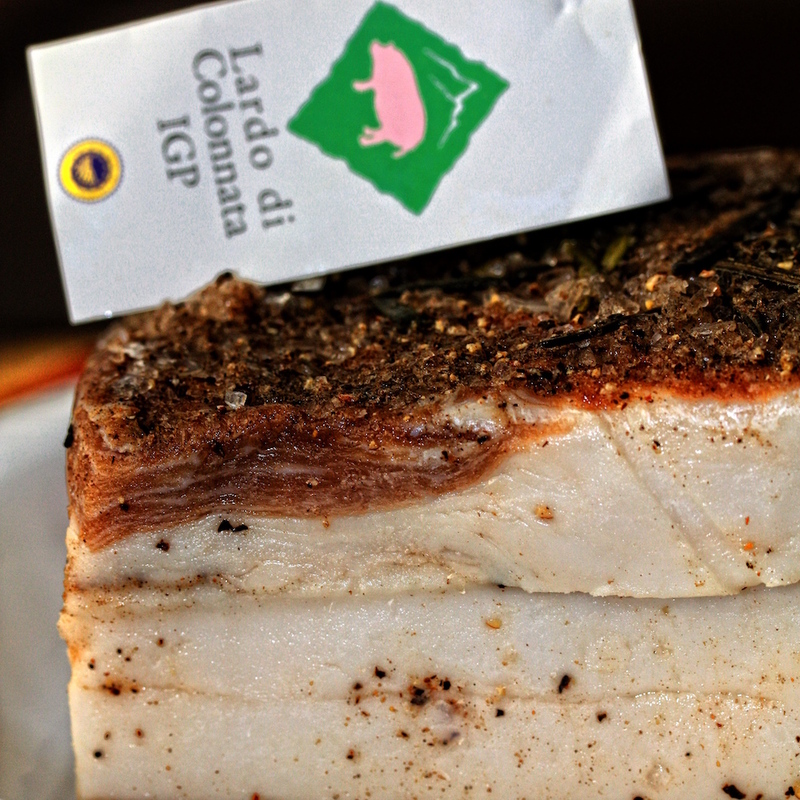 Colonnata is famous for its lardo, the silky-white, spiced, cured pork fat that flavors many Tuscan dishes and is also enjoyed thinly sliced on a plate. Be sure to stay for lunch! This annual celebration of pork fat is worth a trip to the off-the-beaten-track mountain village of Colonnata. You can sample the local specialty any time of year, but the sagra provides an opportunity to appreciate just how much the locals love their lardo. Check the web site for annual festival dates, usually scheduled during the summer. 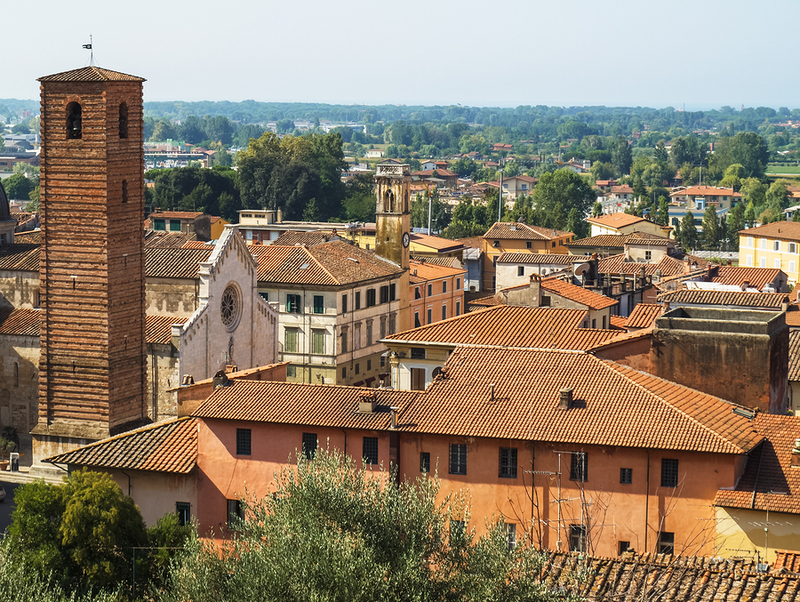 The Tuscan town of Pietrasanta is a mecca for marble sculptors, drawing masters from around the world who want to walk in the footsteps of Michelangelo. Today, the skills and techniques of working marble and other quarried stones and minerals are still passed down verbally from master to student, involving many years of practice. Strewn around their private, dust-filled studios are full-sized reproductions of the masterpieces of Renaissance masters, ancient Roman athletes, busts of royalty, and countless other treasures. Sculptors in training practice in a host of related disciplines such as model-making and bronze casting. If you want to learn more about the techniques and history of marble sculpture, this local museum is a treat. Located in the convent of Sant’Agostino, the museum exhibits hundreds of sculptures in marble and bronze, as well as models (bozzetti) of clay that are the foundation of marble sculpture. It is clear why sculptors from all over the world consider Pietrasanta a coveted destination. The Tuscan coast is one of the Italian people’s best-kept secrets. If you visit in the summer, you can pay a day rate at one of the private beaches, where you can rent chairs and an umbrella, take a dip in the pool, and enjoy lunch or a gelato. 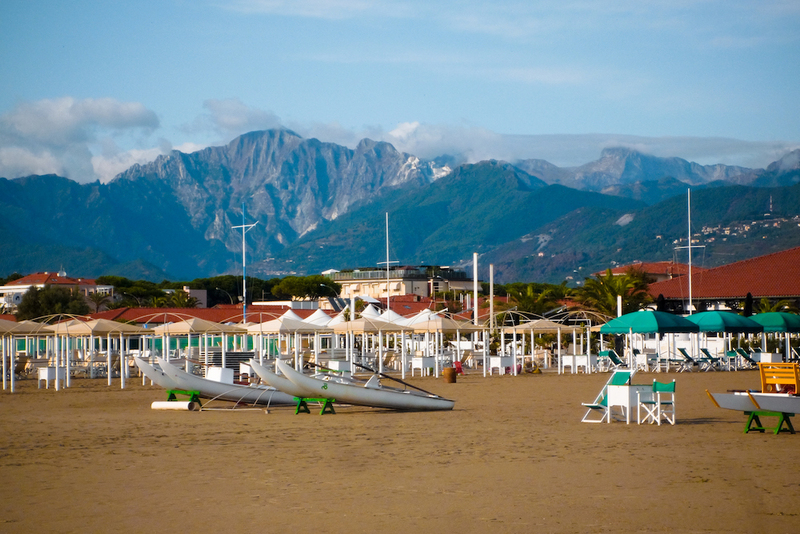 Visit Marina di Carrara, or Forte dei Marmi, a bit to the south. Either way, you can enjoy the beach with the dramatic backdrop of the Apuan Alps—and its beautiful white marble mountainsides. Sculpture is not the only fruit of the Carrara quarries. Artisans in and around Florence have turned the craft of marble inlay into a high art. Inlaid stone was the passion of Grand Duke Ferdinand de Medici, who founded and endowed a workshop for this craft in 1588. This highly specialized technique involves inlaying marble and colored semiprecious stones valued for their brilliance and saturated color into furniture and wooden panels. The technique is sometimes referred to as pietre dure, commesso or opera di commessi, and is closely allied to mosaic. Today, this painstaking art remains in the hands of a few Florentine artisans. Beyond Florence in the Tuscan countryside, other materials are also quarried for works of art. The ancient Etruscan city of Volterra is a center for working alabaster (technically, alabaster is a mineral, not a stone). 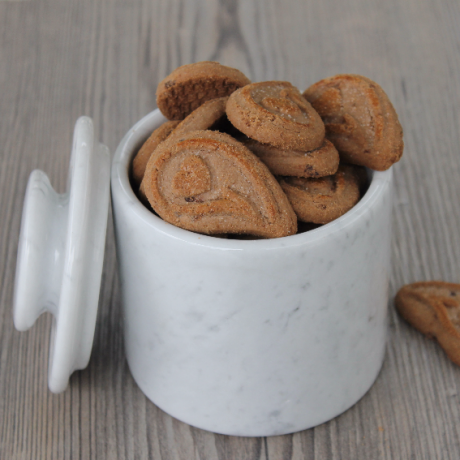 Read on to learn more about this little-known craft tradition. Laura Morelli is an art historian and historical novelist with a passion for Italy. You can find her guidebook series, including Made in Florence and Made in Italy, as well as her Venice-inspired historical novel, The Gondola Maker, in the Italy Magazine shop.